A New York-based theatre friend told me the other day it was nearly time to shake off this mortal coil. No, he wasn’t depressed – it’s just that he felt that, as he is now in his 60s, he’s seen it all already. Everything just keeps coming around again. No, he wasn’t taking about the fact that The Glass Menagerie is returning to Broadway in another new production just three years after the last one there, or that the current Broadway season will also have seen the returns of Cats (already playing) and Miss Saigon, but I do understand his feelings of deja vu. In my case, however, as someone who loves revisiting the same productions I’ve seen before – sometimes again and again – it’s a pleasure, not a pain, to be compelled to do so in new productions of familiar works. And last week in New York I saw two seminal musicals I’d seen the first time around. By theatrical serendipity, both shows shared the same originating director/co-writer, James Lapine, who directed the original component parts of Falsettos with composer William Finn and has again directed their pairing in a new Broadway outing, while his niece Sarna Lapine directed the concert staging return of Sunday in the Park With George that Lapine co-wrote with Stephen Sondheim at New York City Center. But each new production brings fresh pleasures and insights. Sondheim’s shows seem to grow up with you; they mean different things at different points of your life. And Sunday in the Park With George, an aching musical about the art of creation and the creation of art, reveals the painful process of how an artist puts work before life and tries to make sense of life through art. It’s a show I find more haunting with every viewing: it’s the ultimate musical about the process (and personal cost) of creativity – gorgeously summed up in the impassioned Finishing the Hat, as title character George Seurat is compelled to prioritise his work over the visit he’s promised his girlfriend to go to the Follies. At a packed City Center last week, this was sung with intense fervour and passion by the magnificent Jake Gyllenhaal, who has already proved his stage credentials in Broadway’s Constellations, but here revealed the stunning abilities of a serious singer. Who knew he could do this? I never saw him perform in last summer’s City Center production of Little Shop of Horrors, but Seymour and George are very different sings. And what was especially impressive was that, even though this staging was done for only four sold-out performances , he was off-book for most of his songs – though all the company had the reassuring presence of their scripts in folders. So this was not, fortunately, stunt casting of the sort we see all too often, where someone of limited skills is parachuted into a role on the basis of their name and fame, but fails to deliver. And this truly transcendent musical that celebrates art as no other also revealed its performer’s own supreme artistry. When the best two musicals of the season (The Pirates of Penzance, Sophisticated Ladies) are both the work of dead songwriters, you know that the American musical theater is in trouble. Indeed, I can’t even remember the last time I attended a musical – on Broadway or off – that introduced a new composer or lyricist of serious promise. And that’s why I had trouble believing my ears at a new show with the unlikely title of March of the Falsettos. This one-hour musical tells its story through 20 songs by William Finn. The songs are so fresh that the show is only a few bars old before one feels the unmistakable, revivifying charge of pure talent. Those words still resonate now that Finn is now one of the elder statesmen of American musicals, teaching at the Tisch School in Manhattan. I subsequently saw the original Off-Broadway production of its sequel, Falsettoland, when that show transferred from Playwrights Horizons to the Lucille Lortel in Greenwich Village in 1990. It was the early days of the HIV/Aids crisis, and this was the first musical I knew to tackle it head-on. It’s a stunning, healing musical: the son’s bar mitzvah conducted around the hospital bed of his father’s gay lover shows beautifully just how we learned to build our own different families around us. Merged with March of the Falsettos, it became simply Falsettos and opened on Broadway in 1992. I saw that too, with some of the original cast members of both continuing in the roles they originated, including Michael Rupert as gay dad Marvin, Stephen Bogardus as his lover Whizzer, and Chip Zien as his psychiatrist Mendel (who becomes his son’s shrink, and in turn his former wife’s new partner). That was a momentous occasion for the Broadway theatre community, still in the grip of a health crisis that was decimating many of its members, and I’ve never forgotten it. Now that Aids has become a (mostly) manageable disease – at least in the West – it has become easy to forget those devastating early days of the crisis. 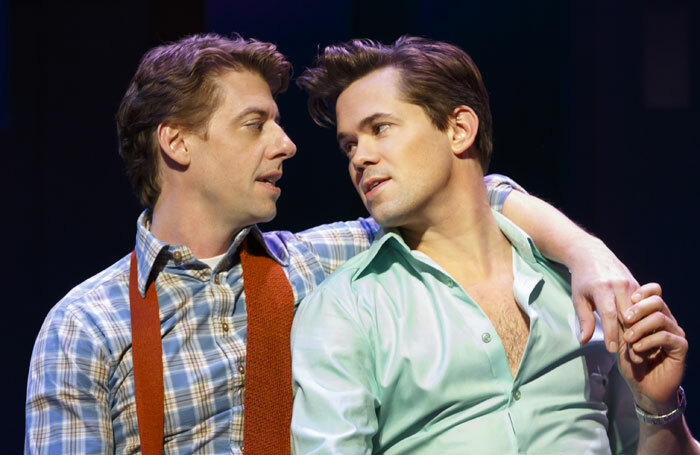 But Falsettos hasn’t become a period piece, and seeing its new Broadway revival that opened on October 27 at the Walter Kerr Theatre, it resonated anew as a piece about building families that was ahead of its time in seeing the normality of gay parenting. A slight disappointment to this production is that it feels like it has been done a bit on cheap, at least scenically speaking. But there’s full value from a cast that includes the busy Christian Borle as Marvin (he’ll segue straight from this to play Willy Wonka in the Broadway premiere of Charlie and the Chocolate Factory this season), the tall and striking Andrew Rannells as his lover Whizzer, and especially the glorious Stephanie J Block as Marvin’s former wife Trina. A British production of this double bill is long overdue. Perhaps Jamie Lloyd will return to it and complete the work he began in 2001?